EDINBURGH Rugby have confirmed the signing of Jack Cosgrove for next season. The 20-year-old prop, who has nine caps for Scotland Under-20s, has signed a two-year deal with the capital club until May 2017. And Cosgrove, who played in four of last season’s age grade Six Nations fixtures as well as the Junior World Championship in New Zealand, said he was ‘over the moon’ to be signing for Edinburgh. 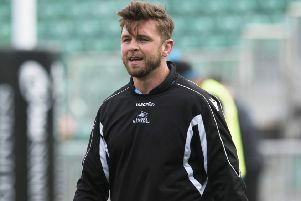 He added: “With the club being in a European Cup Final, they’re really showing they’ve got quality players and everyone is speaking very highly of Edinburgh. The Coventry-born prop joined the Worcester Warriors academy in 2013, making his first-team debut off the bench against Sale Sharks in January last year. He gained experience through loan spells with Doncaster Knights, Malvern RFC and Barker Butts RFC. Cosgrove qualifies for Scotland through his grandfather, who was born in Newtongrange. Cosgrove continued: “[Edinburgh] is a beautiful place to live – I’ve been up a few times outwith rugby – and I’m looking forward to settling there. “I think I’ve got a strong set-piece game and I’m looking to add something extra to the squad. I’m under no illusions it’s going to be tough but there’s a great buzz at the club and I’m eager to improve my game and kick on.